CLIQUE NA ÚLTIMA FOTO ACIMA PARA VER NOSSA VISTA VIRTUAL !! Esta cabine de férias oferece excelentes vistas arborizadas, muito espaço e do ambiente tranquilo necessário para descansar, relaxar e recarregar! A cabine está aninhado nos bosques na elevação 4205 '. A pista principal possui lavanderia, cozinha, sala de estar, Mestre e quartos de hóspedes, bem como, Mestre e casas de banho dos hóspedes. O segundo andar (no piso térreo) oferece uma sala de jogos, quarto de hóspedes e casa de banho completa. Temos também WiFi de alta velocidade, lareira a lenha, deck fechado e aquecimento central e ar. A cabine é muito bem decorados e localizado a apenas 3 milhas do centro de Banner Elk. Nós adicionamos novos colchões queen size no mestre e quartos de hóspedes, bem como novos edredons e travesseiros. Banho Master oferece pias duplas, banheira de imersão, enorme chuveiro e muito espaço. Guest Bath tem pia única e chuveiro em tamanho grande. Downstairs Bath tem pia única e banheira de tamanho completo e chuveiro combinação. We had a great time. The accommodations were great. Owner was very easy to work with. Loved the proximity to everything. Would stay there again. 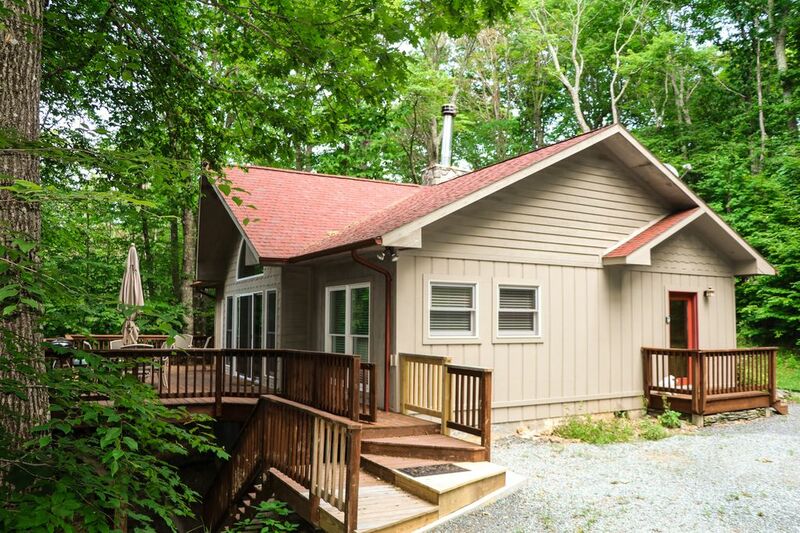 Very nice and spacious cabin that was conveinently located near downtown Banner Elk and both Beech and Sugar Mountain ski resorts. We loved our winter wonderland stay! This house is comfortable and perfect for a family. Great location close to town! Not far from Boone and Blowing Rock, too. Gorgeous views of the snow covered mountain. Marsha was a huge help when our mini van got stuck in the snow. Take her recommendation of 4 wheel drive seriously! She knows what she's talking about. We spent 3 days at Christmas time and enjoyed our stay. We even had a nice dusting of snow Christmas morning! The house is in a great location, tucked away but still close to town. The house was warm and comfortable, even though temperatures outside were in the teens at night! The kitchen was well stocked for cooking and serving the food we'd brought. We felt at home! Very nice and comfortable home. Had a special family time. Met all of my expectations. Enjoyed area golf. Have one suggestion: Extend entrance hand rails all the way to the bottom of steps for easier climbing. This was a very last minute reservation and Marsha went out of her way to make this happen for my family! She answered all emails and phone calls so quickly. The house was great! I've never brought our dog to a vrbo property, but due to the last minute nature of this trip, I needed a pet friendly house. I was a little worried about it. Let me just say: it was so clean!! There was absolutely no evidence that this was a pet friendly cabin, except for the dog treats! Whether you have pets or not, don't let the cabin being pet friendly sway you from staying here. Highlights: 1. a carport! It snowed 8 inches in 18 hours and this carport saved us!! In the summer, it would keep your car cool and in the winter, you didn't have to scrape snow & ice off. 2. Level entrance! When you have 3 children & you are carrying in a 100 bags; this made life much easier. 3. The views are beautiful off the deck! Also, the home is secluded enough that you aren't on top of neighbors but not so secluded you felt completely away from civilization. 4. It has everything you need! Fully stocked kitchen and plenty of towels, blankets, and pillows for everyone. 5. Location. It's 15 minutes from Sugar Mtn and 20 minutes from Beech Mtn. It's close to downtown and great restaurants and the grocery store (Food Lion) is nearby too. It's very centrally located and not too far off the main road. If I had to name any cons, I would say to be overly cautious with the spiral staircase downstairs. It's narrow. We put our 11 year olds down there and kept out youngest upstairs. Also, the tv's in the bedrooms aren't updated, so watching tv in there was hard on the eyes with the poor resolution. The TV in the family room is updated & great. Again, I can't say enough how easy it was to get a hold of Marsha & how helpful she is! During our stay, we were snowed in and they didn't plow the main road. After a few hours, we called her and she made some calls...and the road was plowed within the hour. Before & during our stay, she was so helpful! Holiday rates ($255/per night) will be charged and a 3 night stay will be required for the following holidays: Martin Luther King Jr weekend Presidents Day weekend 4th of July weekend October Holiday rates will be charged December 15- Jan 7 Pet Fee $75/per pet, 2 dogs max.